Barb and Orrie Gingrich of Holyrood, Ont., have quite a crowd of grandchildren. It was 2008 when Barb began to think of all the gifts being exchanged at her place during the family Christmas festivities. Each family bought gifts for all the children and the adults exchanged names among themselves. 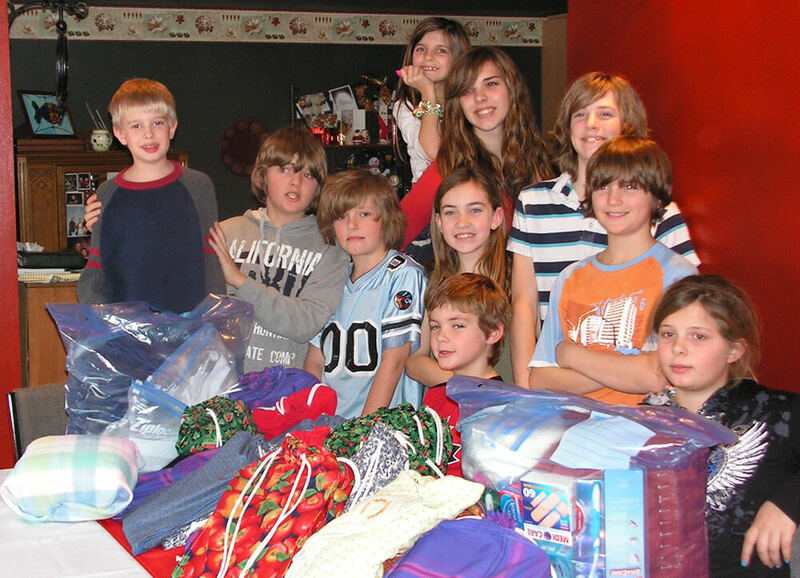 What would happen, she wondered, if the money spent on gifts was funnelled instead into giving gifts to needy people? 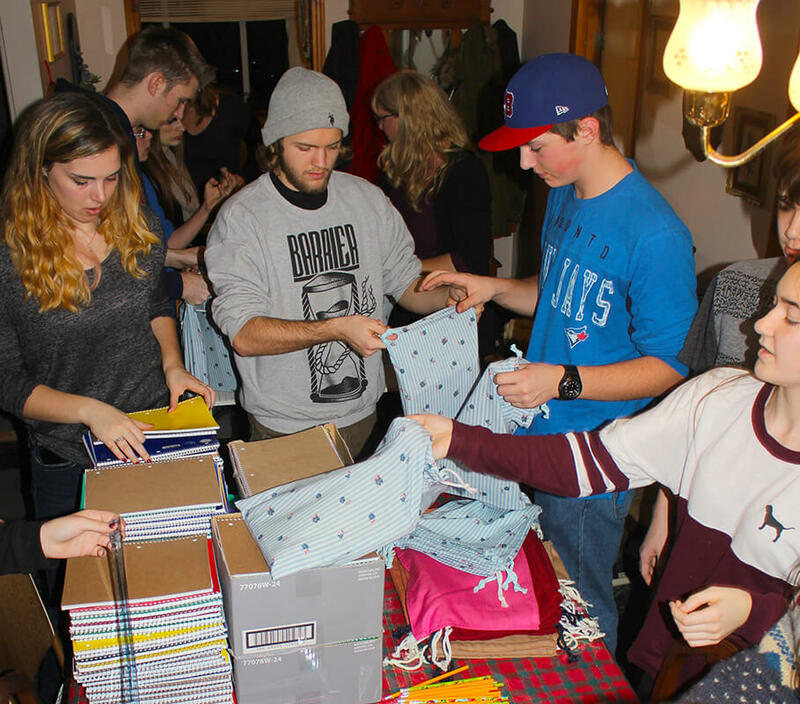 That Christmas, school kits, refugee kits and new mother kits were prepared for Mennonite Central Committee (MCC), instead of giving gifts to each other. The pattern has continued over the years, with the grandchildren now mostly teenagers and young adults, and one change: only school kits are assembled now. 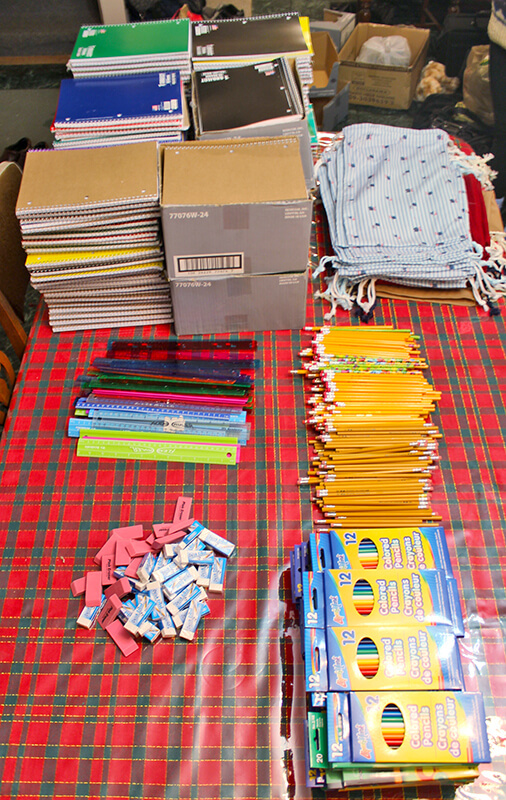 During an afternoon gathering at the Gingrich house, the dining room table is cleared and then assembly begins. But beforehand, Barb surveys the families about how many kits they will contribute, and then she sews the bags. The Gingriches drive Old Order Mennonites in their community to town for appointments and shopping, and throughout the year Barb keeps her eye out for suitable cloth remnants in thrift stores. Daughter Lori Longwell notes that when the last bag is full, the last person on the assembly line pulls the draw string and Grandma puts the finished bags into a box for delivery to MCC in Kitchener, about 120 kilometres from their rural home. The Gingriches, who attend Hanover Mennonite Church, don’t give gifts to the grandchildren “except home preserves or games found at the thrift store,” reports Barb, who adds, “I hope that the children do feel a sense of helping out when things are tough for people.” During the kit assembly, she does give a bit of a speech, she says, to remind the children of the needs of other people. Some years up to 70 kits are prepared! See a video on how to assemble an MCC school kit.